Dr. Karabucak is Chair, Associate Professor of Endodontics, and Director of the Postdoctoral Endodontics Program. He is involved with endodontic courses/seminars in pre- and postdoctoral programs. He also runs selective microscope training courses for predoctoral students. 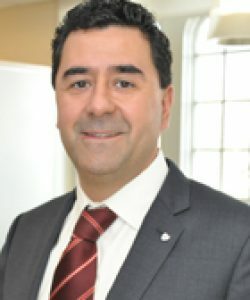 After earning his dental degree from Istanbul University School of Dental Medicine in 1993, Dr. Karabucak completed his endodontic postgraduate training at the Department of Endodontics at Penn Dental Medicine in 1998, where he also received his Masters in Oral Biology in 2002. He also earned his DMD degree from Penn Dental Medicine in 2002. His research interests include the cellular mechanisms of vasodilation and the inflammatory mediators in the dental pulp. Dr. Karabucak has been the attending endodontist at the Children’s Hospital of Philadelphia since 2005 and is a Diplomate of the American Board of Endodontics. Additionally, he has lectured at national and international conferences and also serves as a reviewer for the Journal of Endodontics.